This theodolite, made of brass and copper, belonged to President Thomas Jefferson. Jefferson, who was fascinated by the techniques of surveying, used this theodolite to determine the elevation of the Peaks of Otter in the Blue Ridge Mountains—at the age of 72! One of Thomas Jefferson's theodolites, now preserved at Jefferson’s home in Monticello, Virginia. Image courtesy of H. Andrew Johnson, Thomas Jefferson Foundation. 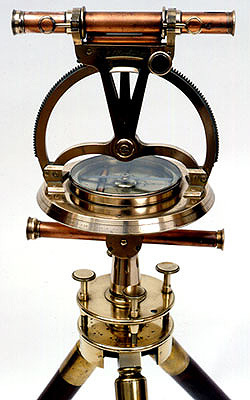 This brass and copper theodolite, purchased by Thomas Jefferson in 1778 and preserved by the Thomas Jefferson Foundation at Monticello, was made by Jesse Ramsden. Ramsden's dividing engine revolutionized the manufacture of accurate theodolites by replacing hand scribing of theodolite circles, which was slow and prone to human error, with higher production and accuracy. Ramsden's brilliance earned him the prestigious Copley Medal, the highest award given by the Royal Society for contributions to science. Others receiving the Copley have included Benjamin Franklin, Charles Darwin, and Albert Einstein. Several of our nation's early presidents spent time as surveyors. Lawrence and Austin Washington inherited the most valuable of the Washington lands when their father died in 1743, leaving younger brother George (future first president of the United States) in need of a profession. George did inherit Augustine Washington's surveying equipment, and, at age sixteen, George embarked on his first career. George headed across the Blue Ridge Mountains, then considered the western frontier, to survey land for Thomas, Lord Fairfax. Abraham Lincoln wrote of the time he spent as assistant to the Sangamon County (Illinois) Surveyor as something that "procured bread and kept soul and body together." Unfortunately, it apparently didn't always pay the bills, as in 1834, Lincoln sold his surveying equipment at auction to pay a debt. While it may not be common knowledge that Presidents Washington and Lincoln were practitioners of the science of surveying, it should come as no surprise that Thomas Jefferson, the same President who referred to freedom as "the first born daughter of science," sent the Lewis and Clark Expedition west and established the Survey of the Coast, was also fascinated by the mathematics and techniques of surveying. Although he filled the post of Albemarle County (Virginia) Surveyor for a short time, Jefferson primarily used his skills on his own lands. However, in 1815, at the age of 72, Jefferson used the theodolite shown here to determine the elevation of the Peaks of Otter in the Blue Ridge Mountains. Sandburg, C. (1926). Abraham Lincoln: The Prairie Years and the War Years. New York, NY: Harcourt, Brace and Company, Inc. pp. 44-46.